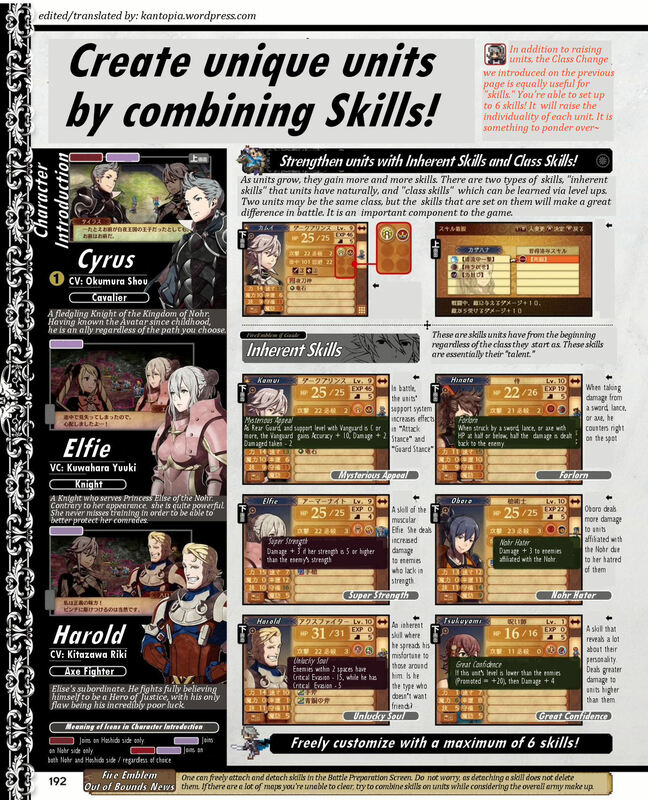 This entry was posted in Fire Emblem, Magazine, Translation, Video Games and tagged 3ds, 5/21, butler, card game, cipher, class change, concealed weapons, cyrus, elfie, english, famitsu, full, harold, hinata, hoshido, if, intelligent systems, japanese, kamui, lissa, maid, marth, navarre, nintendo, nohr, oboro, oni, rinka, samurai, scan, severa, shinobi, shuriken, skills, spellcaster, tcg, tiki, trueblade, tsukuyomi, weapon master. Bookmark the permalink. 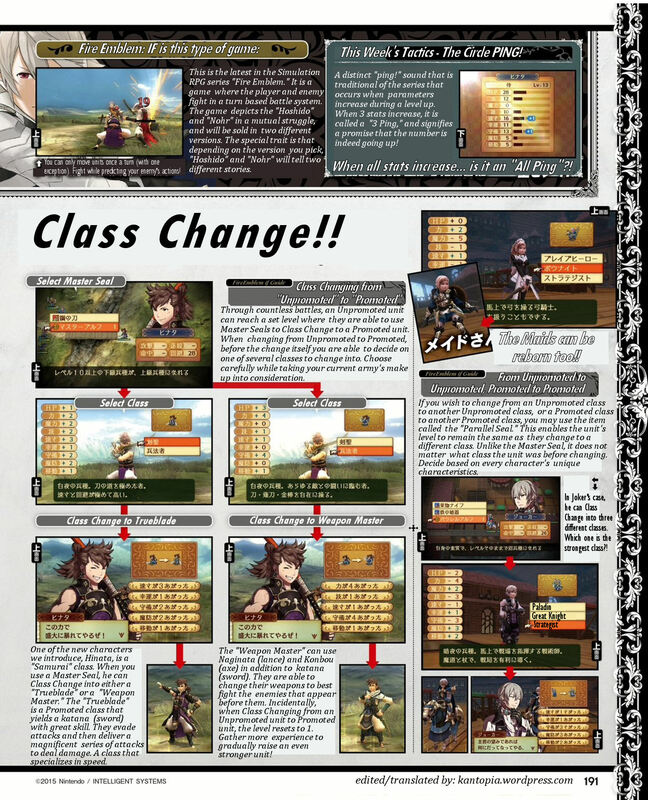 Quick thing to point out, some sources have translated Kamui’s inherent skill as “Good Charisma” or “Mysterious Charisma”. Though I think the translation is “Mysterious Appeal/Charisma”. Anyways, are they ever going to talk about the dragon/kirin/whatever Kamui turned into? ‘Cause I’m busy wondering about it. Indeed, I saw the serenes post and such as Charisma, and I guess that may be a good word to use, but I just used appeal as term that downplays the sort of “leadershio” connotation generally associated with “Charisma” and all. I wonder! 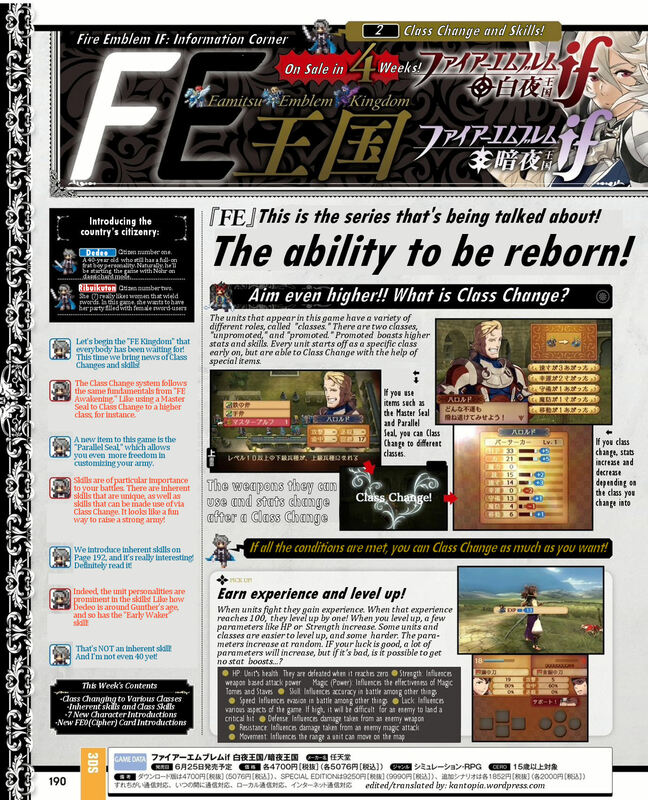 There’s still four weeks until release, so that means three or four more weeks of famitsu articles at least! My guess on Kamui, his dragon form is- A. Some kind of genetic jackpot he got from his ancestry. B. Something signifying that he’s some sort of descendant of a dragon/whatever. C. A power he got that’s plot important by something. Or, my joke guess, Eirin’s shady new drug. :P. Welp, hey, Kamui’s cool now. Though I honestly think that Kamui can’t control his dragon/whatever instincts well. This is quite deep for a Nintendo (I know it’s technically Intelligent Systems but it’s still Nintendo) game. If this is the case, then, it will make for an interesting struggle if they do it right. 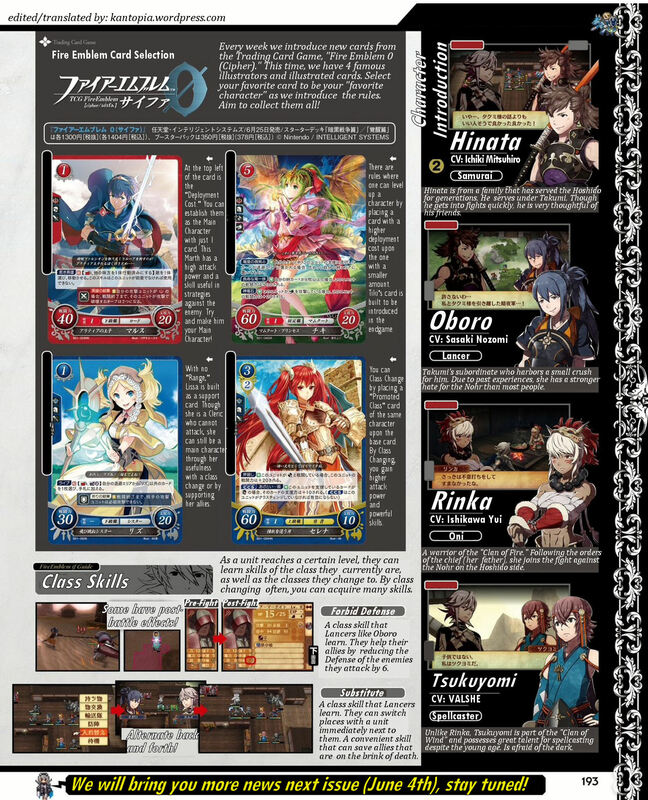 The Fire Emblem series have always been nice and story heavy, often getting into some deep themes. So I would not be surprised if that’s the case! There is a small typo with Harold’s voice actor. His name is Kitazawa, not Kitagawa.